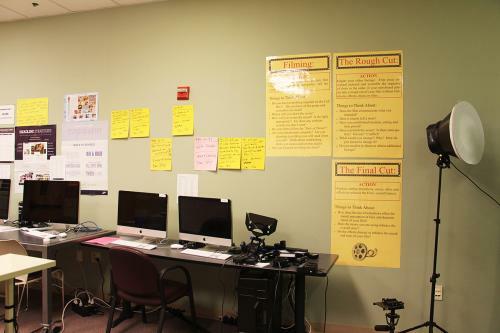 We’re a private, progressive pre-school through grade eight campus, and our lab is housed in the fine arts building. 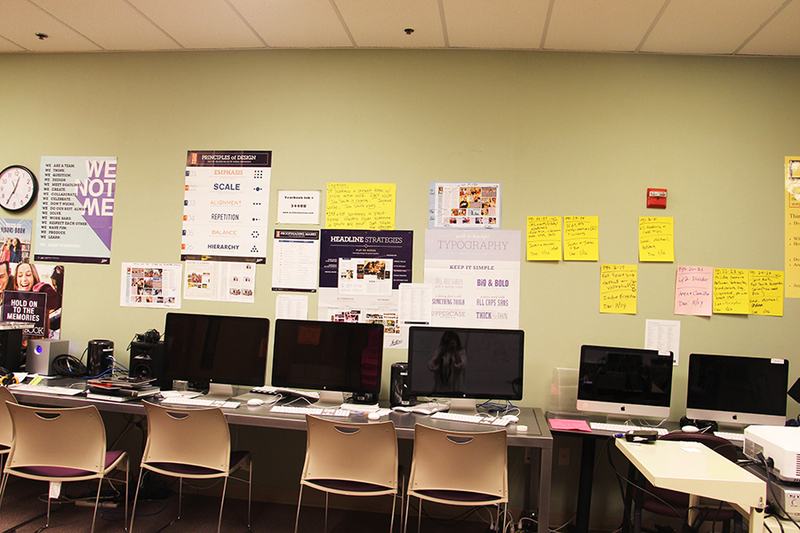 The lab is coming together this year as a co-work space for all our journalism programs. 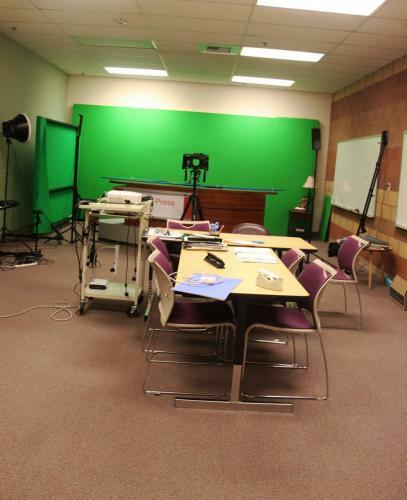 Previously, it served as a studio space for a filmmaking class and as an office. 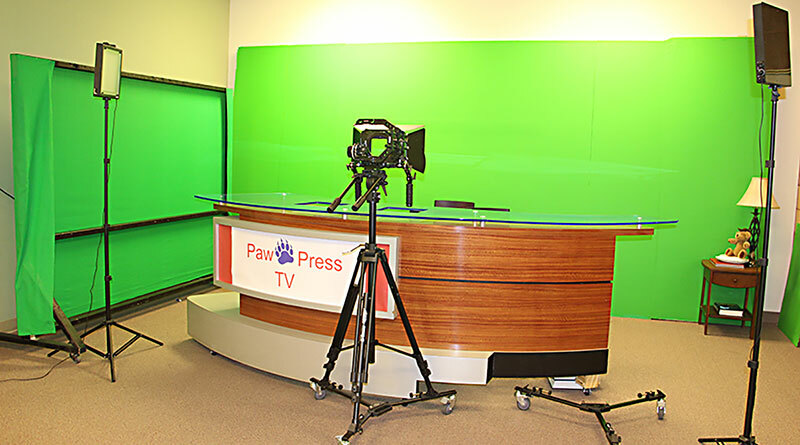 Some of our school’s tech department crew started an extra-curricular news broadcast last year and got the news studio desk donated from a local TV station. 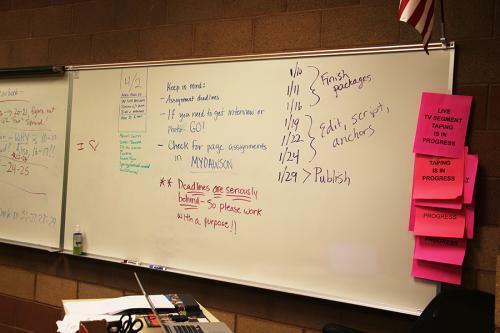 This year, we made news broadcasting an elective class on the schedule, and I also moved all yearbook operations to this lab since I teach both classes, which are open to seventh and eighth graders. I wanted a space our journalism students could call “home.” We keep the computers along the wall due to the placement of outlets in this room, as it wasn’t originally designed for this much technology. Having tables in the middle provides a collaborative space for both staffs, and we keep one end of the lab open for as a filming studio space. Since no one else uses this room, I can configure it however I want and put as much stuff on the walls as necessary. I wish it were a little bigger, but it works for us. Also, since we’re not in the main middle school building, we don’t get as much noise carrying over from other classes as we might otherwise. 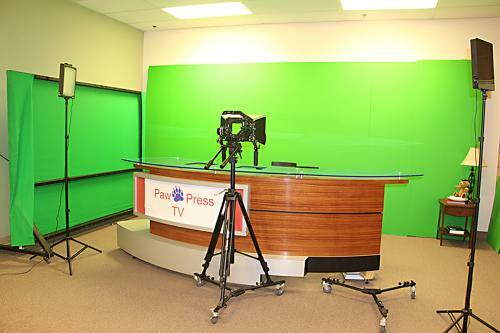 The set up also allows us to get high-quality lighting on our broadcast set when filming anchor spots and stand-ups in front of the green screen. The students love that this space is their little hideaway. They feel like they have someplace special on campus. They like that I can hang all the yearbook reminders and deadlines on the wall right in front of their faces. Before we had this space, we had to work mostly out of my literature classroom in our main middle school building, and we had no dedicated space to keep track of deadlines, hang up the yearbook ladder, etc. 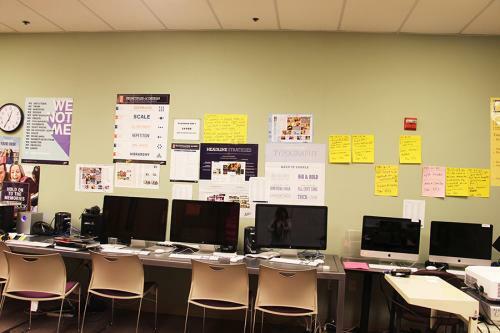 We have six Mac desktops available for use, and because we’re a one-to-one Macbook school, each student has a Macbook Air to utilize, too. Each teacher has a Macbook Pro for classroom and at-home use. 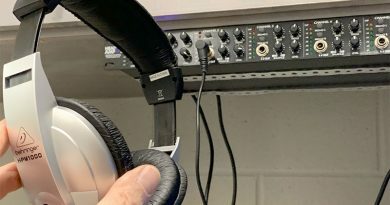 In our lab, one Mac keyboard is configured with an overlay for Adobe Premiere to help kids learn the key functions, and we have an M-Audio M-Track we can plug in via USB to help with sound mixing. 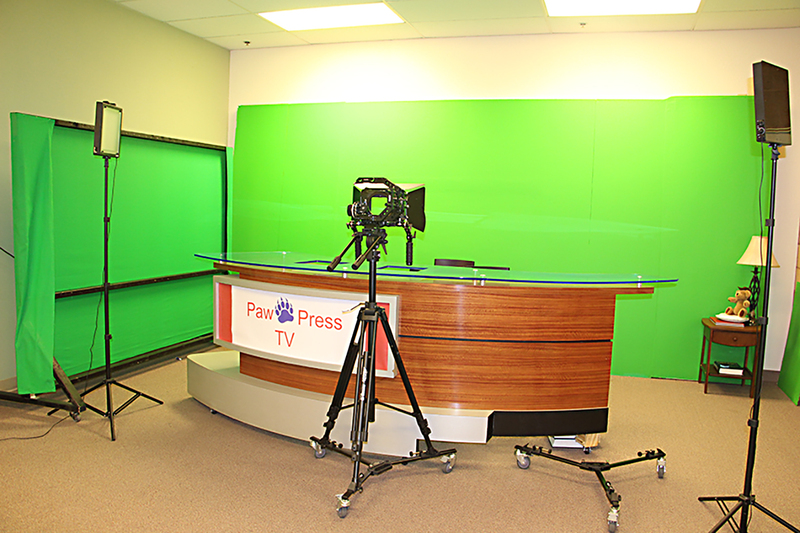 We have four various model Canon DSLRs the students can use plus a variety of Sony and Canon handheld “mini cams” for broadcasting students to use. A lot of our lighting, rigging and microphones were ordered by a previous filmmaking teacher, so we have quite a bit of high-end equipment to use on the broadcast end, and our school’s technology staff uses it often to film campus events. The tech department got a drone this year, but we have not had students use it yet. More than one good, sturdy DSLR that you can hand students to quickly go take necessary photos, even if those students aren’t especially trained photographers. 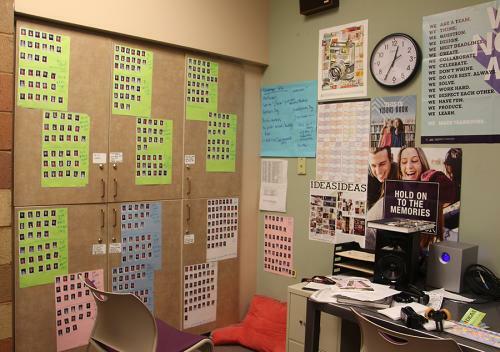 We have a photojournalism class that supplies a lot of our yearbook photos, but my yearbook staff often needs to go take a quick photo themselves to complete a spread. You don’t need the highest-priced camera – just a basic one that gets the job done. Also, for filming school events such as assemblies and pep rallies for broadcast journalism news packages, our Davis & Sanford tripods on wheels and Tilta camera rigging, boxes, and hoods can’t be beat! We’re a private school, so it’s completely funded by the school. I can order what we need within reason. We cover pre-school through grade eight in our yearbook, and the price is included in student tuition, so we don’t collect any yearbook payments nor have to sell ads or fundraise to publish the book. I want to get shelving or a rail installed to hang up all our yearbook awards, and we need some better storage options for a lot of our equipment.